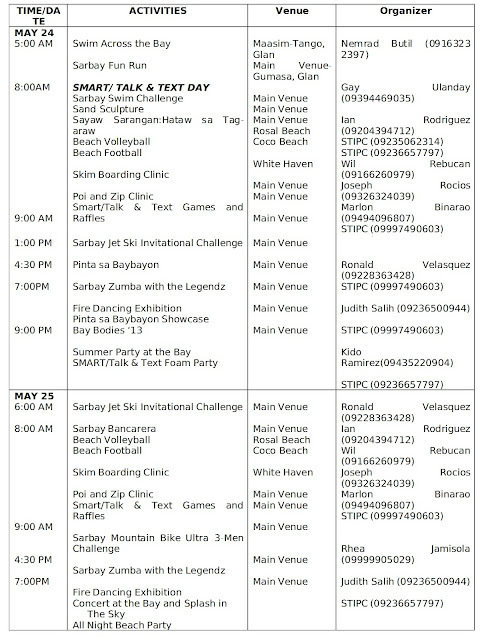 The BIGGEST Beach Party in Mindanao, where everyone always been looking forward to happen every year has finally placed the official schedule of events for this year Sarangani Bay Festival. This has been the Mindanao's greatest summer escapade. Sarangani Bay Festival or also known as SarBay will set the fire by the beach from May 24 to 25, 2013 at the white sand and blue water of Sarangani Bay, Glan, Sarangani Province. So, what are you looking for? Save the date and see you there!